CHICAGO, IL, 4/22/15 – THE SUB-MISSION is pleased to present Cul-De-Sac, a site-specific installation by Díaz Lewis Collaborative. Alejandro Figueredo Díaz-Perera’s and Cara Megan Lewis’ collaborative practice investigates how political relationships and cultural distinctions between their two countries – Cuba and the United States – manifest on a micro- or personal level. Informed by political rhetoric, immigration and property rights, Díaz Lewis dissects relevant themes from two very distinct and often opposing angles. An opening reception will be held on Friday, May 8 from 6 to 8pm. The show continues through Saturday, June 27, 2015. 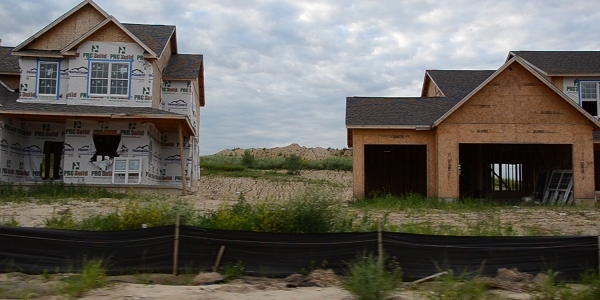 Cul-De-Sac consists of a rotating video projection of panoramic footage filmed at a subdivision consisting of more than 100 houses in the same state of construction. Because of special permits and legal property issues, The Links at Pebble Creek in Le Claire, Iowa was required to be constructed all at once with a single developer obligated to build and sell all homes on speculation. The network of uninhabited, cookie cutter cul-de-sacs appear in an ambiguous state of either construction or destruction, resembling a ghost town or a Hollywood stage more than a master planned community. Accompanying the video projection is a timeless music box melody from Czech composer Bedrich Smetana’s set of symphonic poems Má Vlast (My Fatherland). The audio implies a rich and varied history and offers a counterpoint to the cultural void depicted in the video footage. The combination of the Old World melody with the New World construction evokes a choreography in which the houses themselves are seeking an authentic history and sense of place. The video exposes the skeleton of a yet-to-be populated, already-scripted homogenous society that prizes superficial appearance over true quality. Alejandro Figueredo Díaz-Perera (Cuba) received an MFA in the Department of Visual Arts from Instituto Superior de Arte (ISA) in 2014 and Cara Megan Lewis (Chicago) received an MA in Curatorial Practice from California College of the Arts in 2007. Together they have performed private art actions from Varadero, Cuba to Hong Kong. Their participation in Rapid Pulse International Performance Festival 2014 marked their first public performance together. Also in 2014, Díaz Lewis realized performances through Defibrillator Gallery, Antena Space and Aspect/Ratio Gallery (Chicago).